With its short page count, Reflections in a Golden Eye is more of a novella than a novel. What is disappointing about it is that it takes about fifty pages (the majority of the novella) to get involved in the characters and the plot. It starts intriguingly enough, with the promise of a murder involving the central characters (“two officers, a soldier, two women, a Filipino, and a horse.”), but McCullers’ prose is so cold and distant that it makes the plot inaccessible to the reader. The descriptions of the setting benefit from this and become starkly beautiful — “Then suddenly the sun was gone. There was a chill in the air and a light, pure wind. It was time for retreat. From far away came the sound of the bugle, clarified by distance and echoing in the woods with a lost hollow tone. The night was near at hand.” — but the characters are rendered so abstruse by it that it feels slightly maddening. After thirty pages someone asked me how the book was so far and the only word that came to mind was bizarre. The violence (both subtle and overt) is startling and seems too unreasoned. But stick with it. In the last thirty pages or so you begin to comprehend the pathos of the characters and their situations, and suspense begins to build as the novella heads to its shattering climax. What McCullers is exploring is how repressed desire can turn to intense hatred, and how that loathing can turn to violence in one sudden moment. The characters are all stuck in their own traps, and most of them are being driven mad by desperation. At the center is Captain Weldon Penderton, a repressed homosexual whose desires are so internalized that the only expression they can find is rage and despair. When his colleague, and his wife’s lover, remarks that another character would do better in life if he conformed to the mainstream a little more Penderton angrily disagrees, bitterly wondering “that any fulfillment obtained at the expense of normalcy is wrong, and should not be allowed to bring happiness. In short, it is better, because it is morally honorable, for the square peg to keep scraping about the round hole rather than to discover and use the unorthodox square that would fit it?” When you consider the ramifications that a life of trying to scrape into a round hole have had on him, you can’t help but feel for Penderton. 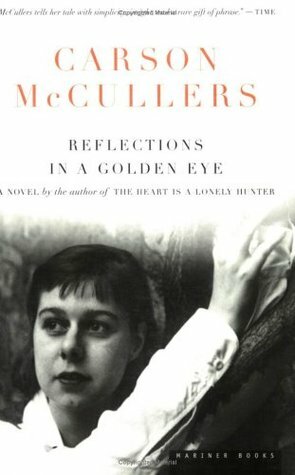 This becomes all the more resonant when you consider that “Reflections in a Golden Eye” was written at a time when McCullers’ own marriage (to a bisexual soldier) was failing as a result of their homosexual affairs. In the end Reflections is a startling and intelligent, not to mention socially important, work. I just wish that it wasn’t so hard to get into in the first place, because its initial heartlessness is a misgiving. There actually is a lot of emotion and depth in this novella, and yet it is only toward the ending that it truly shines. Check out my Great LGBT Books page for more.